Summary: The atonement, the atonement of Jesus Christ, and the atoning sacrifice of Jesus Christ mean separate things and understanding the difference can help us apply atoning principles in our lives. When I was a freshman at college, I remember hearing a quote from Bruce R. McConkie about the atonement that resonated with me. 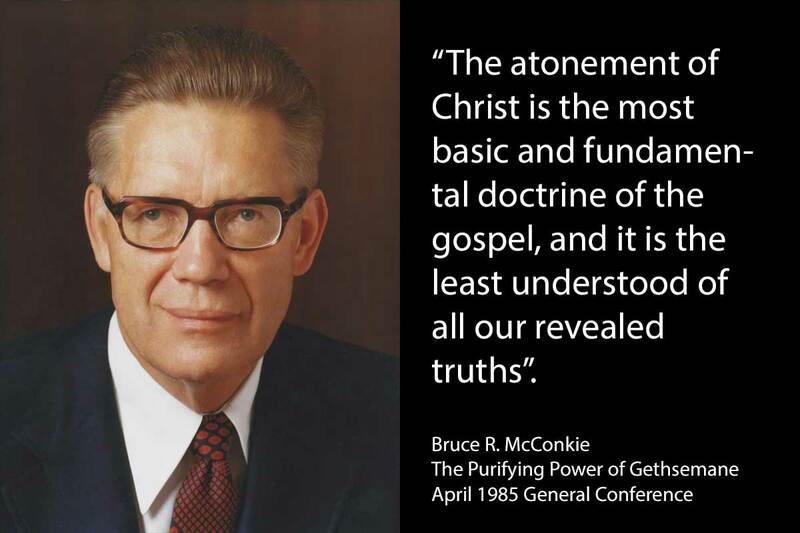 In the April 1985 General Conference, he said, “The atonement of Christ is the most basic and fundamental doctrine of the gospel, and it is the least understood of all our revealed truths” (The Purifying Power of Gethsemane). Wow! How could that be? If the atonement is the most fundamental doctrine of the gospel of Jesus Christ, it seems like it should be the most studied and most understood gospel truth. I took Elder McConkie’s statement as a personal challenge to study and understand the atonement better and I have strived to do so throughout my life since then. One of my initial efforts to learn more about the atonement was to read James E. Talmage’s Jesus the Christ, one of the books on the approved missionary reading list, when I was a full-time missionary in Argentina. That was an educational and spiritually uplifting experience. Through the years I have read countless talks from LDS Church prophets, general authorities, and scholars on the subject of the atonement. A few years ago, I read Brother Callister’s book, The Infinite Atonement, and that was a very enlightening and helpful book. But the biggest strides I have made in understanding the atonement and how it applies to us has come through my personal scripture study and the spirit of revelation that has come to me as I have done so. As I read 2 Nephi chapter 2 verse 10, I realized that this was the first time in The Book of Mormon that the word atonement was used, so I paid special attention to its context and meaning. This led to a major outpouring of enlightenment from the Spirit of God, and somehow, in that moment, I gained great new insight into what atonement is and what it means. It seemed to me that the atonement was being spoken of in a way I had not previously defined it. Atonement sounded like a gospel principle that was being applied, not an event or something the Savior did for me. Of course, the Messiah did lay “down his life according to the flesh, and taketh it again by the power of the Spirit” as mentioned two verses earlier. But Lehi, who was speaking in this chapter, did not seem to equate the Savior’s death and resurrection with the word atonement. I began to realize that the previous definition of atonement in my mind was limited and the Lord started to expand my understanding. I’ll elaborate on my expanded view of the principle of atonement as we continue in this article, but suffice it to say for now that taking the shackles off my definition of atonement was key to understanding its meaning, power, and application to my life. My understanding of atonement has continued to grow and evolve in the proceeding years as I shed misconceptions and gained new understanding through scripture study, reading articles by authorities, and through the spirit of revelation as I pondered the subject. While I think many Church members will benefit from my perspective on the atonement which I will share, I don’t claim that that my knowledge or understanding is complete or perfect. I simply feel the Lord has explained things to me in a way that my brain can understand them. This is my mental model of the atonement, if you will. If your mental model is different, then that’s okay. And if my mental model is wrong, then it is the fault of man, and not the fault of God. Atonement as in the Atoning Sacrifice of Jesus Christ = The act of the Son of God suffering for our sins, bleeding from every pore, dying on the cross, and resurrecting on the third day. 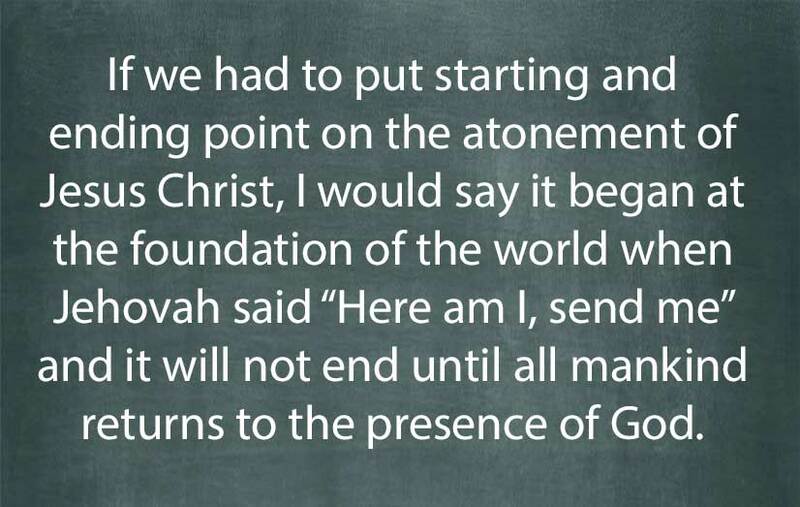 Atonement as in the Atoning Mission of Jesus Christ = Everything that Christ has done and will do to make it possible for each of us to become like Him and the Father and become one with them and live in their presence eternally. Atonement as in the Application of Atoning Principles = The eternal process of becoming one with God that each one of us must experience to become like Him and live in His presence eternally. Our Savior Jesus Christ is a key component of all three definitions. The Savior’s role is obvious in the first two, and the third cannot be completed without Him. We cannot each personally and fully apply the principles of atonement to our lives without the assistance of Jesus Christ. “Since man had fallen he could not merit anything of himself; but the sufferings and death of Christ atone for their sins, through faith and repentance” (Alma 22:14). I may be getting a little bit ahead of myself, though. Before we dive into more detail on each one of the three meanings of atonement, let’s talk about the overarching meaning of the root word atone. I think one of the first keys in understanding the meaning of the atonement is understanding the origins and root meaning of the word. The “ment” suffix in the English language denotes an action or resulting state, a product, or means. Thus, the noun “atonement” is a form of the verb “atone,” and atonement means the action of atoning, or the resulting state of atoning, or the product of atoning, or the means of atoning. LDS scholar Hugh Nibley, who played an important role in helping increase my understanding of the atonement, confirms the etymology of the word atone. “Atonement, an accepted theological term, comes from neither a Greek nor a Latin word, but is good old English and really does mean, when we write it out, “at-one-ment,” denoting both a state of being “at one” with another and the process by which that end is achieved.” (The Atonement of Jesus Christ, Part 1 by Hugh W. Nibley). When you take that as your definition of atonement, a whole new world of meaning and applications open up—at least it did so for me. For example, I have often thought long and hard about what it means that God the Father and Jesus Christ are one and what it means for us to be one with God (see John 17: 11, 21). My improved clarity on the meaning of the atonement helps me understand more what that means and how it is possible. I also begin to see how foundational the atonement is to the gospel and how it is an all-encompassing principle of truth. I begin to understand more the statement from Brigham Young that “Mormonism includes all truth. There is no truth but what belongs to the Gospel. It is life, eternal life; it is bliss; it is the fulness of all things in the gods and in the eternities of the gods” (Teachings of Presidents of the Church: Brigham Young, Chapter 2). If it’s not all coming together yet, I apologize. The Spirit of God has, at times, given me great bursts of much knowledge all at once and also taught me line upon line over time. It all makes sense in my mind, but sometimes it’s difficult for me to figure out how to best present these topics in a linear fashion like this article. I think if we continue, it will start to make more sense. Let’s go back to those three definitions of atonement and look at each in more detail. We’ll start with the more granular definition and move up to the larger and overarching definitions. Throughout my life in the Church, I have often heard the atonement equated with Jesus’ suffering in the garden of Gethsemane when he bled from every pore (Luke 22:44 and D&C 19:18). Or some have expanded that definition to say that the atonement began in Gethsemane and continued through the Savior’s scourging and crucifixion and resurrection. As I now understand, though, the Lord’s excruciating suffering in Gethsemane and on the cross, which he faithfully endured to the end for us, is better labeled the atoning sacrifice of Jesus Christ. While the events over those days could qualify as the most crucial part of the atonement, I do not equate them with the atonement. The atonement, the general and overall term, is much bigger and we will explore that further in a moment. I think people limit and hurt themselves by abbreviating the atoning sacrifice of Jesus Christ to a simple phrase like the atonement. Misuse of the term atonement may be a contributing factor to many members not understanding the atonement or how to apply the power of Jesus Christ in their lives. I think we as a Church would be better off to not use incomplete generalization phrases like “the atonement” or even “the atonement of Jesus Christ” to describe the atoning sacrifice of Jesus Christ, even though those shortcut phrases have been used quite frequently by both Church members and leaders for many years. I know it will take a lot of time to break this habit, but it needs to happen if we are to really understand and benefit from these gospel principles. I have been talking to my wife for years about the real meaning of atonement and the frequent misuse of the term, so I was very glad to hear a high-ranking authority like President Nelson address the subject with all members of the Church in the worldwide General Conference. As I believe is now clear, the atonement isn’t the same as the atoning sacrifice of Jesus Christ. The atonement, in its true definition, includes much more than just the suffering in Gethsemane and on the cross by our Savior. I don’t wish to diminish in any way those events and what He did for all humanity by suffering in dying and resurrecting for us. I just think the atonement, as a principle and process, is much larger and grander. Even the phrase “the atonement of Jesus Christ” means much more than the atoning sacrifice because it includes His life and mission and that leads us into the second definition of atonement. If we delineate the atonement of Jesus Christ from His atoning sacrifice, it’s clear that His atonement is bigger or encompasses much more. Again, the atoning sacrifice was the crucial part, but in my mind, the atonement of Jesus Christ neither began in Gethsemane nor ended at the resurrection. I believe His atonement is the entirety of His mission. 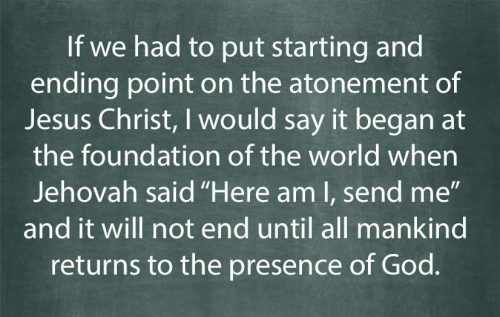 If we had to put starting and ending point on the atonement of Jesus Christ, I would say it began at the foundation of the world when Jehovah said “Here am I, send me” (Abraham 3:27) and it will not end until all mankind returns to the presence of God (see 2 Nephi 2:8-10 and Alma 42:15,23). The Atonement of Jesus Christ is real and powerful and cannot be underestimated in its eternal importance and infinite reach. But I think that perhaps the Latter-day Saints would understand the atonement better and how it applies to their life if we would talk about it differently. In my experience, many people talk about the atonement as if it is a magical power Jesus hands to us or a magic wand we can wave in order to get blessings or other results. I believe that the atonement and the power therein and the applications in our lives are much more tangible than that, if we come to truly understand it. And I believe that if we would talk about atonement like we talk about other principles of the gospel that it would be more applicable to our daily lives and overcoming our struggles. And that’s a nice segue to the third definition of atonement. At its highest level, I believe atonement is an eternal, ongoing principle. 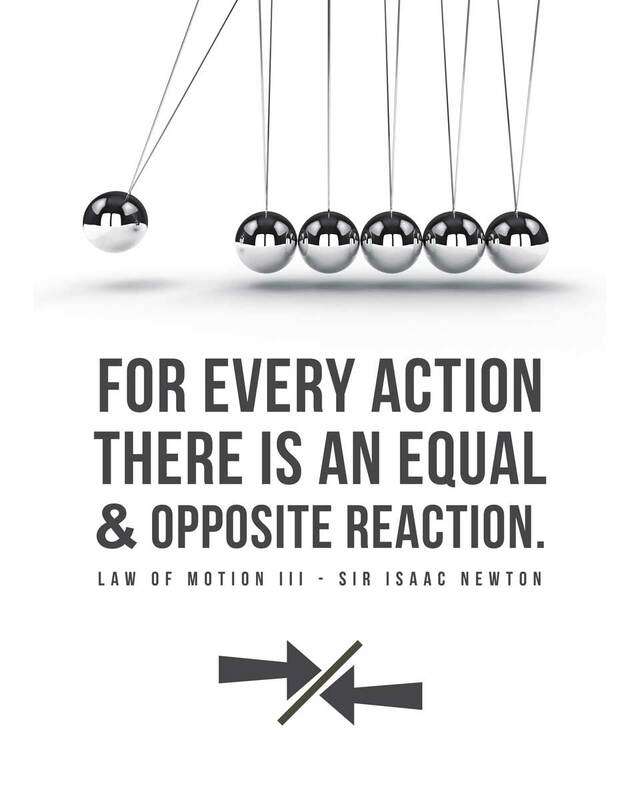 Understanding this principle is what has been really impactful in my life in recent years. As I have come to understand the atonement as a principle, I realize why the confusion exists for many people between understanding the atonement of Jesus Christ and applying it to our lives. 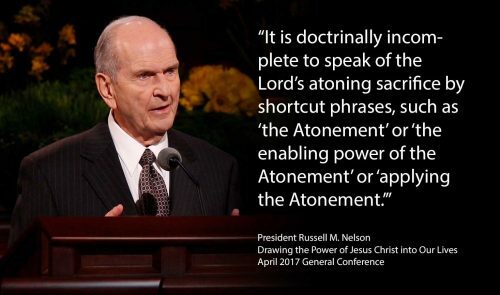 In order to understand the atonement as a principle, let’s visit again the definition of the word atone, which, as Brother Nibley pointed out, literally means the state of being “at one.” In the religious sense particularly, being at one means being at one with God, whole, complete, or integral, and atonement is the process by which that state of being at one is achieved. 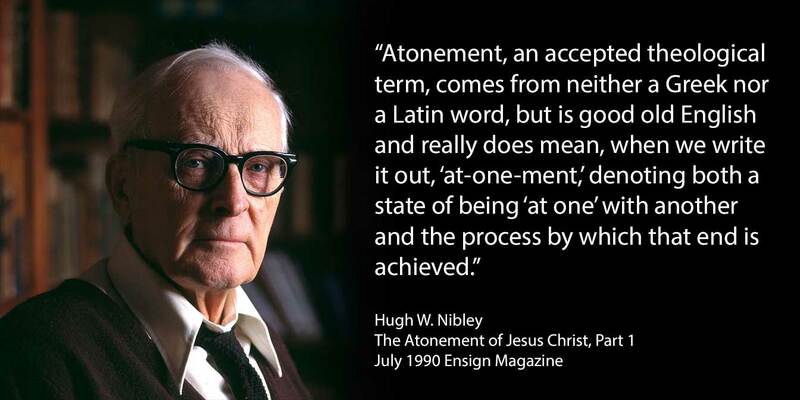 Brother Nibley points out that “the word atonement appears only once in the New Testament (Rom. 5:11 in the King James Version), and in the Revised Standard Version it does not appear at all, the translators preferring the more familiar word reconciliation. (See also footnote to Rom. 5:11 in the LDS edition of the King James Version.) Reconciliation is a very good word for atonement there, since it means literally to be seated again with someone (re-con-silio)—so that atonement is to be reunited with God” (The Atonement of Jesus Christ, Part 1 by Hugh W. Nibley). He further explains other near synonyms for atonement are redemption, rescue, and resurrection. In my own study, I have found additional near synonyms of atonement throughout the scriptures such as unity, oneness, sealing, one eternal round, circumspection, return, repent, perfect, opposition, overcome, restore, truth, and integrity. Even the scriptural literary pattern of chiasms, which I will not go into here, illustrates the eternal principle of atonement. In my mind, I often visualize the principle of atonement as symmetrical patterns or a complete circle. 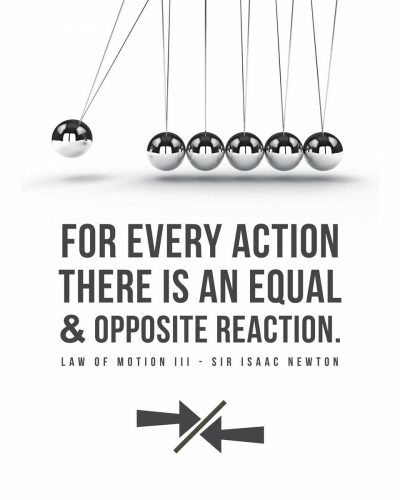 Newton’s Third Law of Motion—For every action, there is an equal and opposite reaction—is also a good illustration of the principle of atonement. 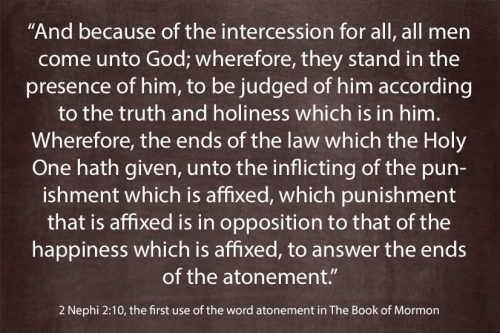 The Book of Mormon prophet Lehi, I believe, was articulating this understanding of the concept of atonement when he said “For it must needs be, that there is an opposition in all things” (2 Nephi 2:11). This statement, not coincidentally, came immediately after the first usage of the word atonement in the Book of Mormon as discussed above. Many, perhaps all, laws and principles and ordinances of the gospel have root in the principle of atonement. Repentance demands that we make recompense for our mistakes, where possible, so things that we have broken can be made whole, or at one again. Because of the effect of our sins (the first half of the symmetry), baptism washes us (the second half of the symmetry), thus bringing us back to our former state of cleanliness, wholeness, or oneness before God. The law of sacrifice illustrates many principles of atonement, not the least of which is how it points to the atoning sacrifice of Jesus Christ which was completed to make things whole, or at one again. A central part of Jesus earthly ministry was healing, or making whole or at one, things that had gone wrong in this life. In the law of consecration, everything that God gives us (the first half of the symmetry) we give back to Him (the second half of the symmetry), thus returning to a state of oneness. Vicarious temple work for our ancestors is an example of the effort to make things at one, as we do ordinances for those who, if not for the sins of the world in which they lived, would have received them during their life. Part of the Law of Moses, as I understand it, illustrates the principle of atonement by prescribing a punishment equal to the crime with an eye for an eye, and a tooth for a tooth (Exodus 21:24, Leviticus 24:20). Jesus taught the higher law to the Jews when he was on the earth, and that higher law also has roots in the principle of atonement. “Ye have heard that it hath been said, An eye for an eye, and a tooth for a tooth: But I say unto you, That ye resist not evil: but whosoever shall smite thee on thy right cheek, turn to him the other also” (Matt 5:38-39). You may wonder how turning the other cheek is an illustration of the principle of atonement. I think the Book of Mormon prophet Nephi explains it well as he describes the suffering and crucifixion of the Savior which he saw in vision. “And the world, because of their iniquity, shall judge him to be a thing of naught; wherefore they scourge him, and he suffereth it; and they smite him, and he suffereth it. Yea, they spit upon him, and he suffereth it, because of his loving kindness and his long-suffering towards the children of men” (1 Nephi 19:9). We as mortal, imperfect beings commit sins, which is one half of the symmetry, and Jesus willing suffers for it, and that is the other half of the symmetry, thus bringing things back to a state of atonement. When Jesus applied atoning principles to his life, we call that the atonement of Jesus Christ. We also need to apply atoning principles in our lives if we are to inherit the kingdom of Heaven and thus we need to perform our own work of atonement. In the Church, I’ve never heard anyone use language like that before, so I hope I’m not out of bounds putting it that way, but that is the natural conclusion of this line of thinking and the Spirit confirms its truthfulness to me. We help ourselves and others in the world get to the state of atonement by applying gospel principles. Take the following as a real-world, common example. When someone cuts us off in traffic, we could get mad at them and yell and scream and cut them off in return, and that would be justified, but it does no one any good. Alternatively, we could also forgive them, let ourselves pay the consequence for their rude behavior, and then it does a world of good for them and for us. For us, it gives us power over our emotions and keeps us in control rather than being a slave to the natural man’s reaction. For them it also brings blessings, though it may more long-run than short-run, as they realize their mistakes and your magnanimity towards them, it will create feelings of sorrow initially, and then love and devotion toward you for enduring the effects of their mistakes. And you can see, then, how principles of atonement will eternally bless all parties in this fallen world in which we live. Applying atoning principles is what will eventually rise us from our fallen state and bring us back to the presence of God. You see, then, how we can be “joint-heirs with Christ; if so be that we suffer with him, that we may be also glorified together” (Romans 8:17). You can see, then, how atonement is not something Jesus did for us so much as it is the application of principles of the gospel which we do together with Jesus. The Savior’s atoning sacrifice and His atoning mission are things Jesus did for us, and those cannot be replaced, nor can we progress without them. But one of the most common things Jesus taught during His earthly mission to was follow Him, and we are to do that by following His example in applying atoning principles in our lives. And we can better make that application and receive the blessings associated with it when we better understand the meaning of atonement. 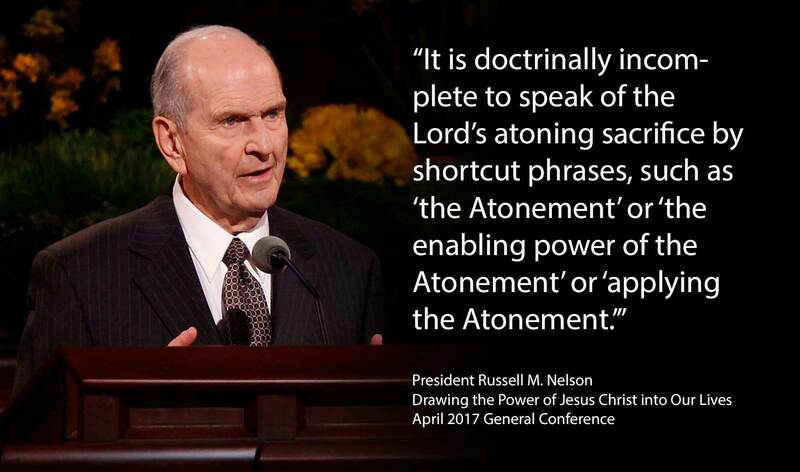 With this new and improved understanding of atonement, I hope it is clear why President Nelson labeled as ‘doctrinally incomplete shortcut phrases’ the common things we tend to say in the Church like “applying the atonement of Jesus.” Throwing that phrase out like a sound bite or using it out of context will often twist, or perhaps obscure, the meaning of atonement. Because I have recognized the need to apply the larger concept of atonement to my life, in recent years, I have found myself speaking more in terms of principles of atonement, and only speaking of the atonement of Jesus Christ when I really mean his mission, and of course referring to the atoning sacrifice of Jesus Christ as just that and not with any shortcut phrases. Again, the very way that we talk about this subject could be the source of the trouble many people have in understanding and applying atonement to their lives. I have found that this mental and verbal change has made the atonement more applicable in my life and circumstances. I should also point out that the “atonement” as a principle and the “atonement of Christ” as in His mission, could be considered synonymous if you think of the later phrase not as a singular event but rather as the atoning process that we all must go through for eternal life and exaltation, which is the same atoning process that Christ went through. I believe that each one of us needs to work out an atonement. That’s not to say that we must perform the same infinite atoning sacrifice that the Savior did—that is a gift from God. “For behold, I, God, have suffered these things for all, that they might not suffer if they would repent” (D&C 19:16). We do need, however, to reach a state of atonement, or unity with God. And the need to be one with God shouldn’t be a foreign concept to anyone familiar with the scriptures. “I say unto you, be one; and if ye are not one ye are not mine” (D&C 38:27). If being saved, in a religious sense, means being one with God, then I think we can safely paraphrase the third Article of Faith and encapsulate much of this discussion: We believe that through the Atonement of Christ, all mankind may be made one with God, by obedience to the laws and ordinances of the Gospel. 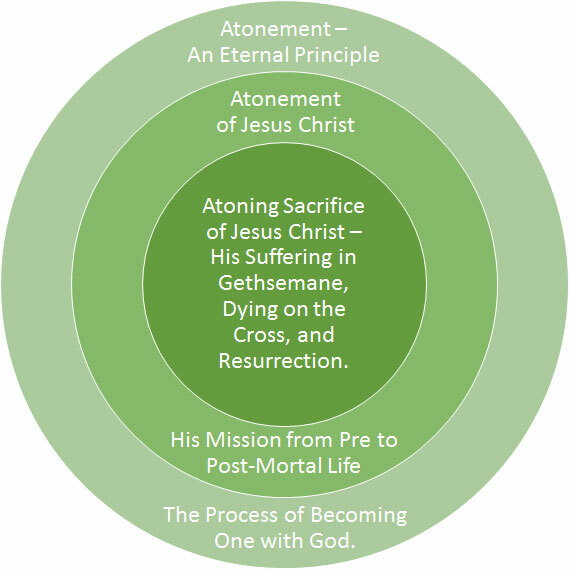 Atonement is both a central and all-encompassing principle of the gospel of Jesus Christ. 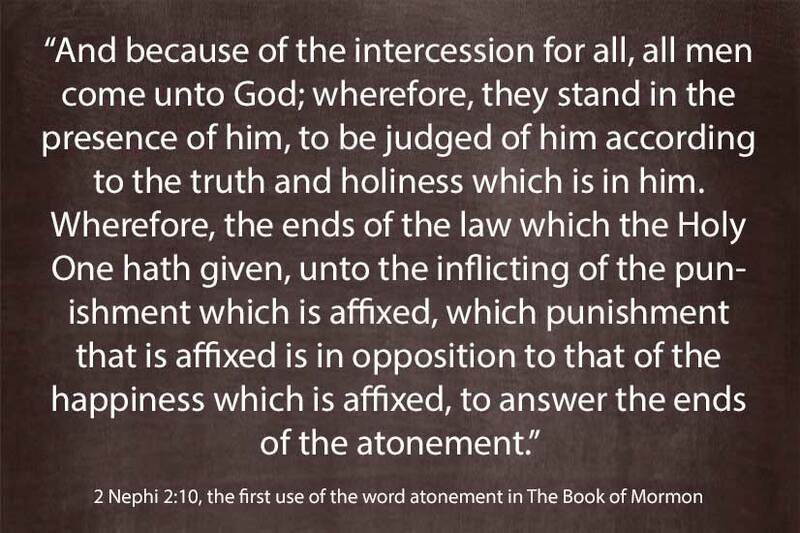 The implications of this understanding of atonement are indeed infinite and eternal, as described in The Book of Mormon (2 Nephi 9:7, Alma 34:10-12). If your experience is anything like mine, as you come to understand the atonement more fully, the scriptures and the plan of salvation will open up to your mind like never before. You’ll start seeing the atonement, or atonement principles, everywhere in the gospel, throughout the scriptures and in all the dealings of God with man. Perhaps it goes without saying, but these are my thoughts on the subject of atonement and do not necessarily represent those of my church, The Church of Jesus Christ of Latter-day Saints. Of course, I feel my opinions are founded in the teachings of the prophets and in the scriptures, and most importantly in the inspiration from the Holy Ghost that I have received. If there are errors in what I have presented, they are my errors as an imperfect reflection of God’s perfect light and truth. The Spirit reveals many wonderful truths to my spirit, but my temporal mind and body is not yet in a state of atonement nor able to fully understand nor communicate these beautiful eternal principles. I feel like I’ve barely scratched the surface in answering the question about what the atonement means, but hopefully this has provided a good launching pad for you in your personal studies. I hope this explanation of how I see things has expanded your vision of the meaning and application of the atonement and that the Spirit of the Lord will continue to give you additional insights into how to apply it to your life. Good analysis. The breadth and depth of the Atonement of Jesus Christ is extensive and profound. Good work. The Exhausted West Is the Lamanite Dark Skin Literal or Figurative?